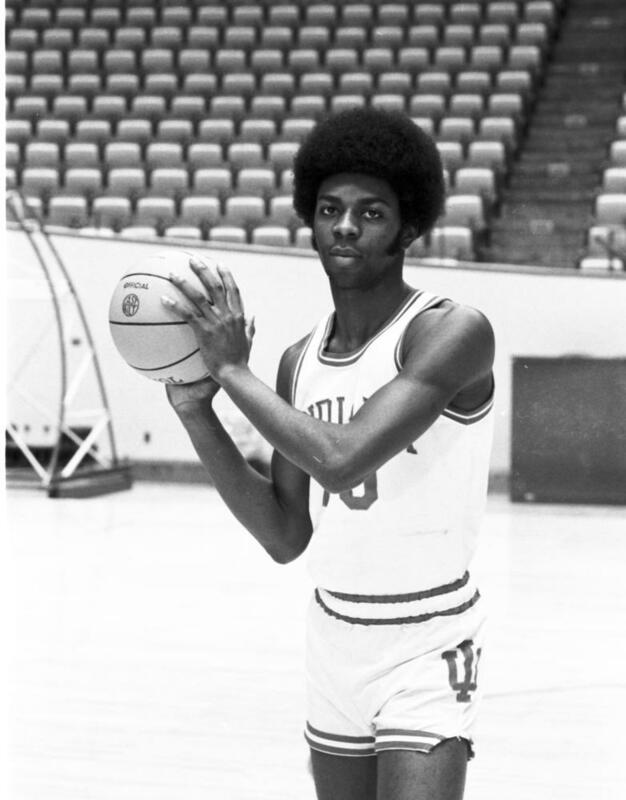 Collector’s Note: When Bob Knight arrived in Bloomington in the fall of 1971, his first team would wear the cream and dark maroon uniforms that were a throwback from Lou Watson’s final season as head coach. However, the 1972-73 season would bring a change in both style and color. 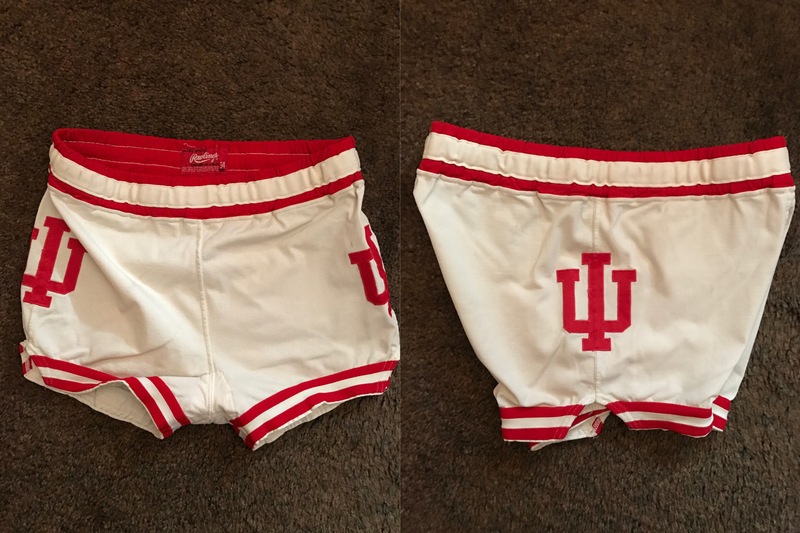 Red and white uniforms would be introduced, which incorporated the IU pitchfork style logo for the first time ever on the shorts. I have only seen two other pairs of game worn shorts (made by Rawlings) that incorporate this style of pitchfork design, as it was limited to only about two seasons. A more rounded “U” would be used during the middle 1970’s, including the 1974-75 and 1975-76 seasons. 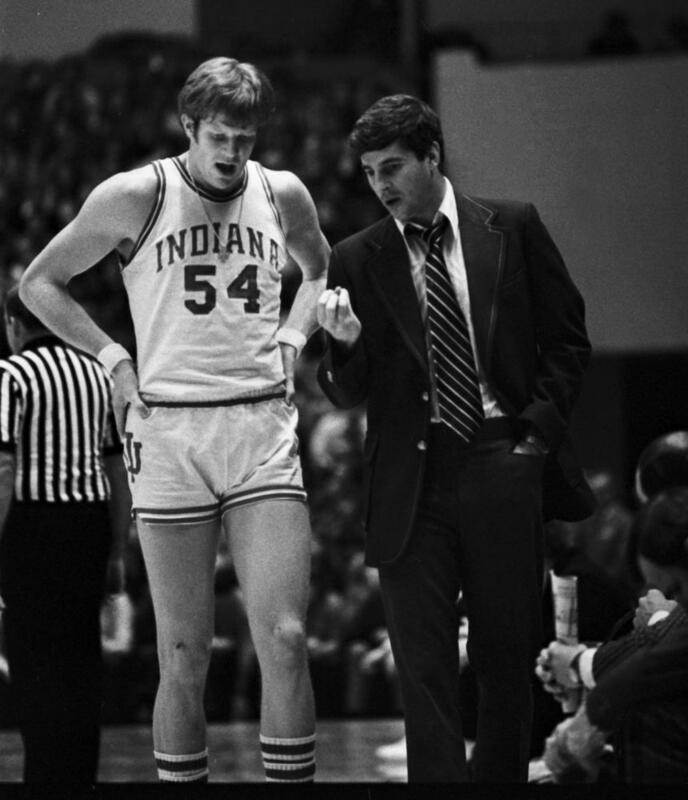 If you were a player in the Bob Knight era, the shorts that you wore were, well, short. The restrictive length of the shorts was especially noticeable against certain opponents, especially during the early 1990s when Indiana would face Michigan and the Fab Five. All kids my age, Michigan fan or not, wanted a pair of those Nike shorts. Yes, I was lucky enough to have a pair (depending on your definition of “luck,” I suppose), much to the chagrin of my mother. In any event, when OG Anunoby began wearing his shorts at a length that lacked normalcy in this generation of sports and uniforms, it was in many ways refreshing, and a throwback to simpler times in Indiana basketball. I thought back to the days where “short shorts” were the norm, despite their questionable style and probably even more questionable comfort level. Their first Big Ten title under Coach Bob Knight. A Final Four appearance, the first for IU since 1953. And, the new red and white uniforms that were introduced at the beginning of the season would also pair up well with the candy-stripe warm-up pants that Knight had introduced during the 71-72 season. Back from Knight’s first season were veterans Steve Downing and John Ritter, as well as strong sophomores Steve Green and John Laskowski. The 72-73 season also marked the beginning of freshmen eligibility in NCAA basketball games. This meant that Knight’s strong crop of freshmen including Quinn Buckner, Tom Abernethy, and Jim Crews were immediately available (Buckner, as a freshman, would actually start every game but one during the season). Bobby Wilkerson pictured wearing the first pitchfork design on shorts in this 1974 photo. Courtesy: Indiana University Archives. The Hoosiers entered Big Ten conference play with a 7-2 record, including victories over Kentucky and Notre Dame. After a 2-0 conference start with wins over Wisconsin and Ohio State, Indiana was able secure a big victory over #6 ranked Minnesota 83-71 shooting a blazing 72% from the field in the second half. IU was atop the conference standings at 6-0 (following victories against Michigan and Michigan State) before dropping two consecutive games to the likes of Ohio State and Purdue to go to 6-2. IU bounced back quickly against Illinois on February 12th, 87-66. behind a 41-point effort by senior Steve Downing. Over the final five games of the season, Indiana would go 4-1, to finish atop the conference alone at 11-3 (Minnesota, who entered the final game of the season tied atop the standings with Indiana, lost their final game to Northwestern to finish second in the Big Ten Conference). The undisputed Big Ten Championship was the first for Indiana since 1958 (IU was co-champions in 1967). With great momentum entering the NCAA Tournament, Indiana would defeat the likes of Marquette (75-69) and Kentucky (72-65) to face the undefeated and defending national champion UCLA Bruins in the Final Four, held in St. Louis. UCLA, a heavy favorite entering the game, was gunning for an unprecedented 7th straight NCAA title under coach John Wooden. In a battle from start to finish, it came down to questionable officiating, which led to Steve Downing fouling out of the ball game with under 8 minutes remaining that was the turning point. With Downing gone, Indiana was not able to hang on and fell 70-59. UCLA would go on to clinch the NCAA title. Even with seniors Steve Downing and John Ritter departing, high hopes would remain for 1973-74 season. 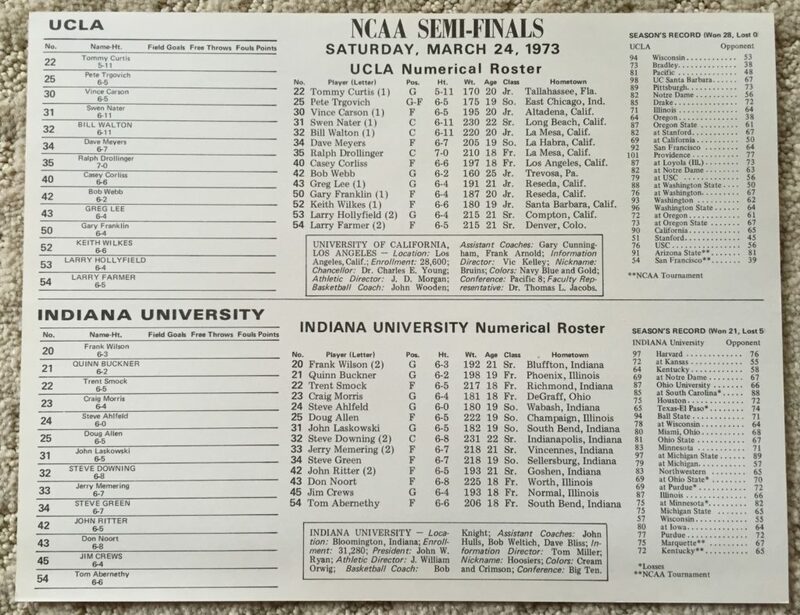 A 1973 Indiana vs. UCLA press flip card. The 1973-74 roster featured a plentiful amount of talent, but lacked senior leadership. Nonetheless, expectations were high following the Final Four run in 1973. Returning starters Steve Green, Quinn Buckner, and Jim Crews, along with key reserve John Laskowski brought experience to the table. However, freshman Kent Benson, a New Castle, Indiana native, would have big shoes to fill in replacing departed big man Steve Downing down low. IU once again would finish the pre conference season at 7-2, and had achieved a national ranking of 7th in the country. Indiana began the Big Ten season on the road in Ann Arbor against the Michigan Wolverines. In a game that Indiana had in their hands at the half, Michigan would prevail late with a 73-71 victory. The loss must have “rallied the troops”, most likely with a little motivation from Knight himself, as Indiana would run off 12 straight victories to sit atop the conference standings. With two games in the season remaining, two victories would give Indiana its second straight outright Big Ten Championship. However, a loss in Columbus versus Ohio State, and a home victory to finish the season against Purdue would leave Indiana tied atop the conference standing with Michigan. Head coach Bob Knight talks with freshman big man Kent Benson. Benson is seen sporting the original pitchfork style shorts, introduced during the 1972-73 season. Courtesy: Indiana University Archives. Since Indiana and Michigan had split their series, a special one-game playoff, to be held on a neutral court (Champaign, Illinois), would take place between the Hoosiers and Wolverines on March 11th. The winner of the game would earn the NCAA Tournament berth (both teams, however, would be co-Big Ten conference champions). Michigan would prevail 75-67, costing the Hoosiers a chance to reach a second straight NCAA Tournament. Instead, the Hoosiers would play in the CCA (Conference Commissioners Asssociation) Tournament, defeating the likes of Tennessee, Toledo, and USC to take the tournament crown. The Bob Knight era was off to a flourishing start with two Big Ten titles in his first three years on campus. Success was only beginning, however, as the next two seasons in Bloomington would produce the greatest combined success in the program’s history.